Learning to count money and understand money concepts, like purchasing and budgeting, is an important life skill for our students with severe disabilities! I want to share some quick tips with you and a few of my favorite money resources. All of the resources linked in this post are ones that I actually use in my classroom with my students! 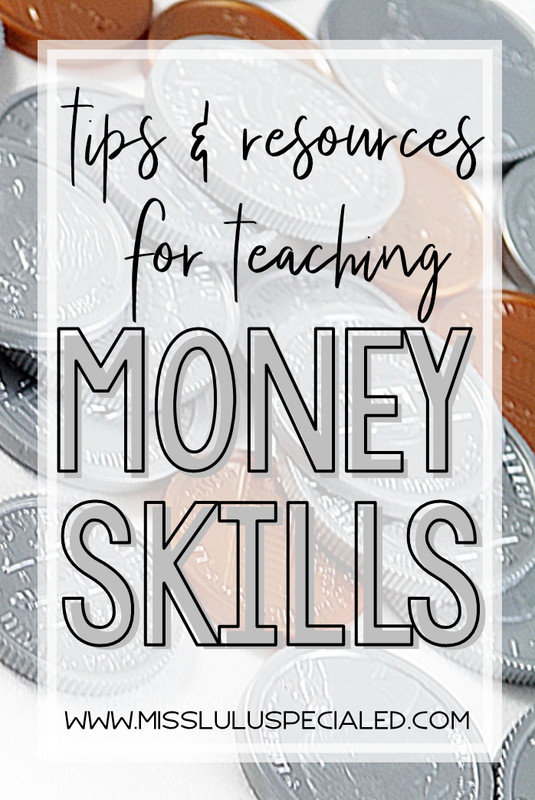 When teaching students to count coins, remember that in order for the skill to be really functional and applicable in their lives, they probably won't be counting a pile of money that you give them. When we use coins in real life, we need to know which coins to pull out of our wallets to pay a certain amount. Often, this is a more difficult skill for students than counting a given set of coins but it's a more real life skill. Make sure to teach coin equivalents too. Students should understand that 5 pennies is equal to a nickel, 2 nickels is equal to a dime, and so on. Be realistic about what the student will need to do in their life. For example, if a student is learning to count coins, they probably should know how to count amounts up to $1.00. It's highly unlikely that a student will need to count coins up to amounts higher than $1.00. We don't want to see our students taking their piggy banks to the stores in the future! My students love this coin identification Go Fish game! These Color by Coin worksheets are a fun way to provide extra practice in a different format. And this Coin ID work task is great for your independent work center and it's free! I love these money centers from The Bender Bunch, especially the Money in my Pocket center. It really gets students thinking about money! These Money Comparison Task Cards from my store are great practice for counting coins and also require students to compare amounts. Often, I see teachers move on to Next Dollar if a student isn't grasping the concept of counting coins. However, realistically, a student who can count coins should also understand the concept of Next Dollar, or rounding up to the next whole dollar amount to cover the change. How often do you go to the store with exact change? Probably not very often. Don't forget to teach students what to do in a situation where they may not have change. I like to make sure I spcify the types of bills a student is using as well when I teach the Next Dollar method. It doesn't make sense to me to work on only $1 bills all the way up to $50. It's easier to teach each bill as it can be used. 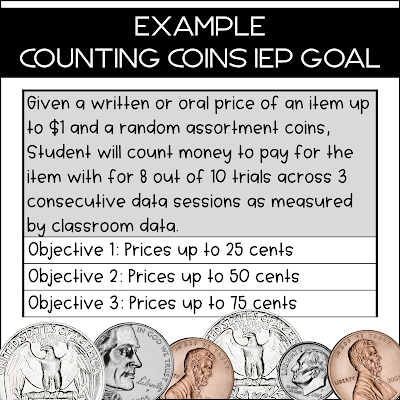 Here's an example of how you may write the IEP goal. Favorite Resources: I love the app called Next Dollar Up. The settings can be changed for students to make purchases all the way up to $50 and it allows students to use different types of bills. 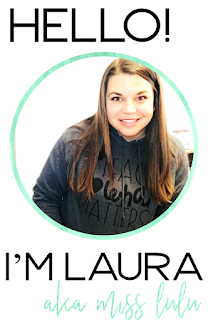 Sped Adulting has the greatest interactive activities and I love her Next Dollar Up interactive resource! 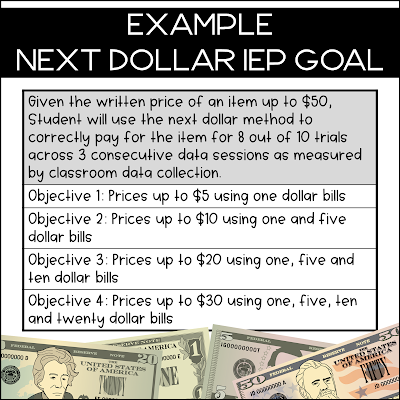 I also love this Next Dollar Up Instructional Mega Bundle from Autism Classroom News. Budgeting: If you think that budgeting is a skill that doesn't need to be introduced in elementary or middle school, I urge you to reconsider! Students, even elementary students, need to understand whether they have enough money to make a purchase. Budgeting can be as simple as that! I also like to start teaching which costs more and which costs less in middle school. 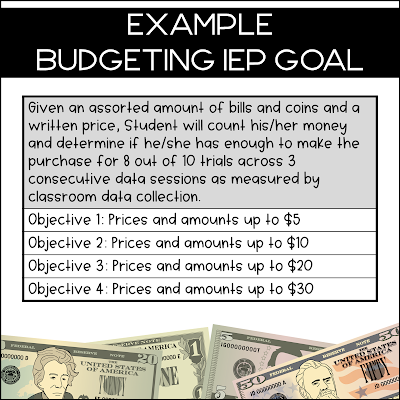 If you have a classroom store, you can easily incorporate budgeting instruction! Have students keep track of their account balance and determine which items they have enough money to purchase. Here's a simple and free account balance sheet. You can even help them create savings plans to save up for more expensive classroom store items. Budgeting Resources: I love these adapted books from The Autism Vault! My students choose to work on them all the time! 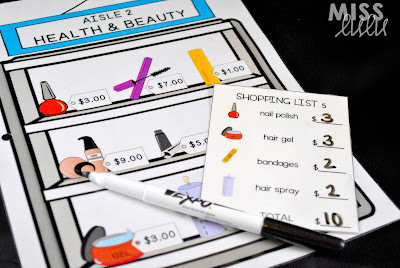 We also use this Grocery Budgeting resource in my classroom. It comes with 3 different levels so all of my students can use it at their own level! 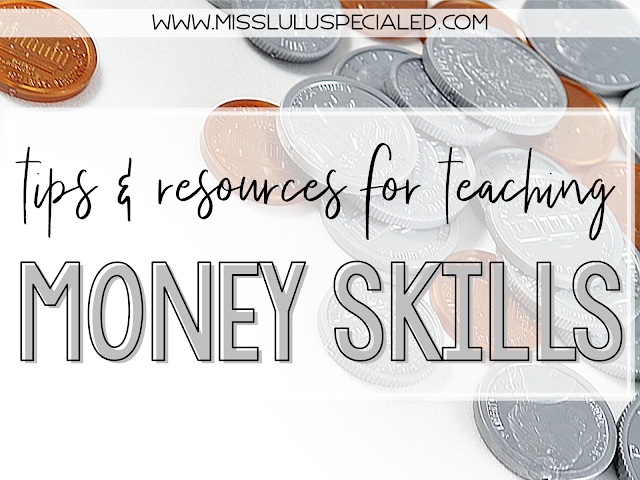 If you have a favorite money resource that's not already listed, feel free to link it in the comments! Thanks for reading!